After visiting one of my favorite food blogs dollyrubiano I discovered a beautiful post using kawakawa tree leaves in a delightful looking chicken soup recipe. It was a very enchanting post and after a few back and forth comments to each other we decided we would coordinate a back to back minted pea recipe. 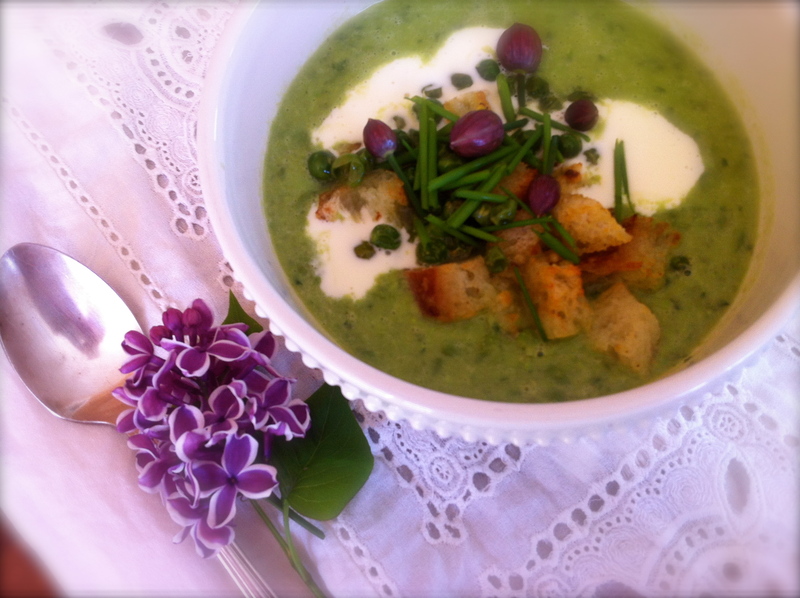 Here is my minted pea soup recipe. You must go see her recipe and amazing blog! Her photographs are remarkable and her recipes are extraordinary. This soup was sensational! 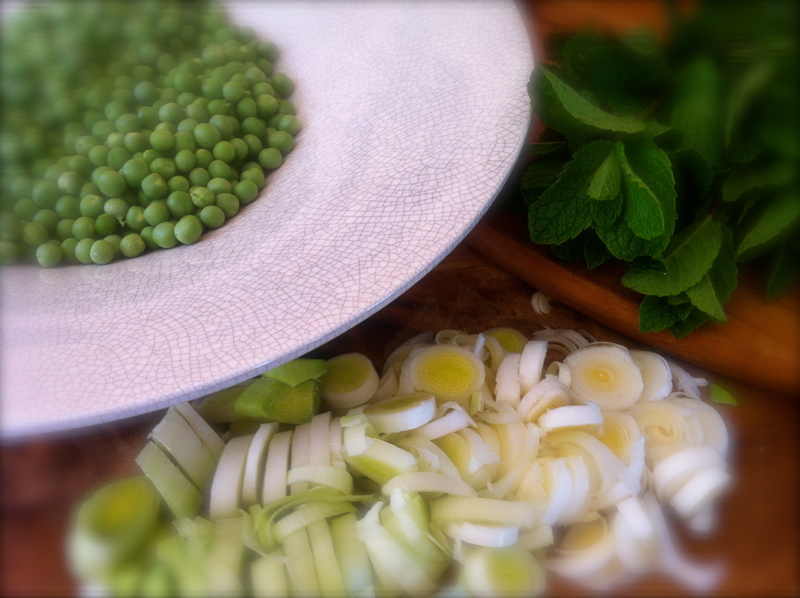 Very simple to prepare, especially if you are fortunate enough to find fresh english peas…already shelled. If you are unable to find fresh peas I think using frozen peas for this soup will be delicious all the same. I roasted a handful of the peas, tossed in olive oil and salt in the oven to create a nice crispy topping for the soup. The chives in my garden are just now blooming so I added a few of the buds on top. Heat the butter in a heavy stock pot, cook the onion and leeks over medium heat until tender. Add the peas and stir to coat well. Pour in chicken or vegetable stock, increase to high heat and bring to a boil. Cook for 5-10 minutes until peas are tender. If you are using frozen peas they will take less time to cook. Turn the heat off and add the mint, salt and pepper. Puree your soup using a hand blender. I discovered using a hand blender for soup is much easier and less clean up. You may blend directly into your cooking pot. If you are using a counter top blender, puree the soup in batches. Place 1 cup of soup in the blender, place the lid on and puree on low speed. With the blender still running open the vent hole and slowly add more soup until soup is pureed. 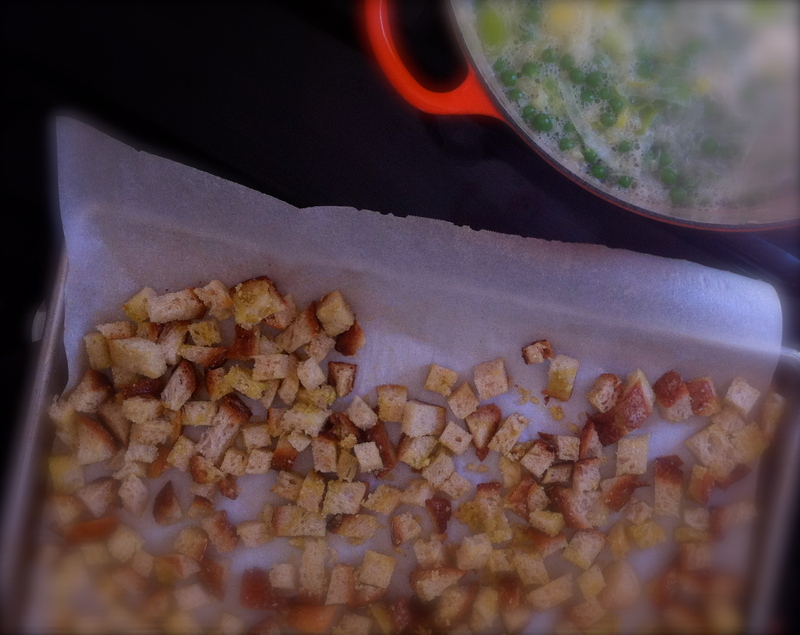 Ladle into serving bowls, spoon in the creme fraiche and top with chives and croutons. Several weeks ago I posted a crouton recipe. Now I have found a much improved method of preparing croutons I would like to share with you. You’ll need 4 or 5 slices of crusty day old bread, sliced into cubes. Place bread in a large bowl, drizzle 1/4 cup olive oil, sprinkle a little salt, 2-3 chopped or pressed cloves of garlic and 1/4 cup parmesan cheese. Toss well to evenly coat and place on a parchment lined baking sheet. Bake in a 475° oven until toasted, turning occasionally with a spatula until well toasted. Simple. You may want to add some fresh herbs too! That’s how I keep my last two or three slices of the loaf…in the freezer for future croutons! Let me know how the kawakawa does in the soup, if you make it! It was fun! Let’s do it again! Oh what a beautiful soup, I love peas and mint. I don’t know if we have fresh peas yet at the farmers market but it’s good to know frozen will do. Sounds heavenly! Gorgeous soup! Peas and leeks are my favourite spring veggies. I haven’t tried making a soup like this with mint before, but it sounds delicious. I have a mint plant now so I will have to try once it gets a big bigger, I think I only have about 2 tbsp worth so far. Thank you for the compliment. :) This really is a nice springtime soup. Before you know it the mint will be growing wild on you! sounds great! I’m finishing up questions and I’ll post this evening. Thank you again! pea soup is always comforting and i love your creative touch of adding mint which should give the overall taste a unique flavor. Brilliant! true. it is a vey comforting soup. Prior to this soup I have only had split pea soup with ham hocks. This soup was very light and great for spring! me too! now they are in full bloom out back! You are currently reading minted pea soup at COTTAGE GROVE HOUSE.